I'm beginning to get a little more adventurous with the colours of nail varnish I wear. Until this year I had tended to be the kind of person who would choose a favourite nail colour and then wear it until it I got bored of it, or the varnish dried out – I would also have usually opted for a pale or shimmery pink. But with my new-found adventurousness I've decided to embrace this summer's fashion of colour blocking and have tried out a few of the new colours in the Tropical collection of Resist & Shine varnished by L'oreal. There are five colours in the new collection and they all have a fruity theme – pomegranate, passion fruit, fig, watermelon and dragon fruit – hence the Tropical nametag. They are all astonishingly bright and perfect for matching with a single-colour dress for the height of summer. My particular favourite was the 'wonderful watermelon' which is a vibrant red with a hint of pink. 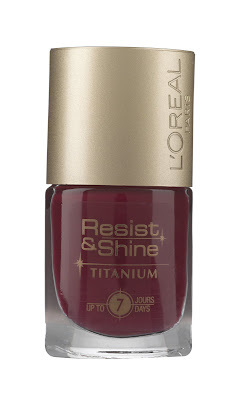 The bottles of L'oreal varnish are a groovy non-traditional shape with a shiny gold-coloured lid. The lid comes clean off to reveal a plastic handle which is designed to be less slippy then just holding the lid itself. It's a neat idea but I found the non-slip brush handle a bit small for my great long fingers and hands! 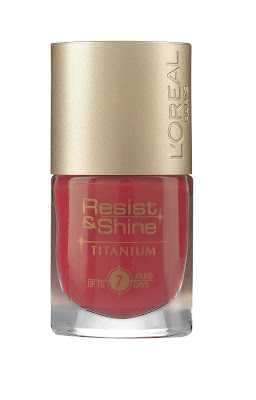 L'oreal Resist & Shine varnished make a bold claim of 'upto 7 days' on their bottle but I struggled to last 7 hours without big chips appearing at the top of the nail (even with a good base and top coat). I also found that it was hard to get a really clean smooth covering on the nail but I suspect that has more to do with the fact that they are bold, bright colours that are very unforgiving of mistakes or poor application than it is to do with the varnish itself. Resist & Shine varnishes contain ceramide R which is designed to protect the nail surface and the formular of the varnish is specifically designed for frequent use so won't trash your nails by drying them out. I really noticed an improvement in the healthiness of my nails when I used these varnished for a fortnight. With my usual shimmery pink favourite, my nails do dry out (so I tend to top up the varnish to compensate, which just makes the problem worse). In summary, I think the juicy bright colours in the Tropical Collection are perfect for this summer but the varnish itself didn't impress me – wearing one of them to match an outfit feels like a little bit of a comprimise between colour and quality.